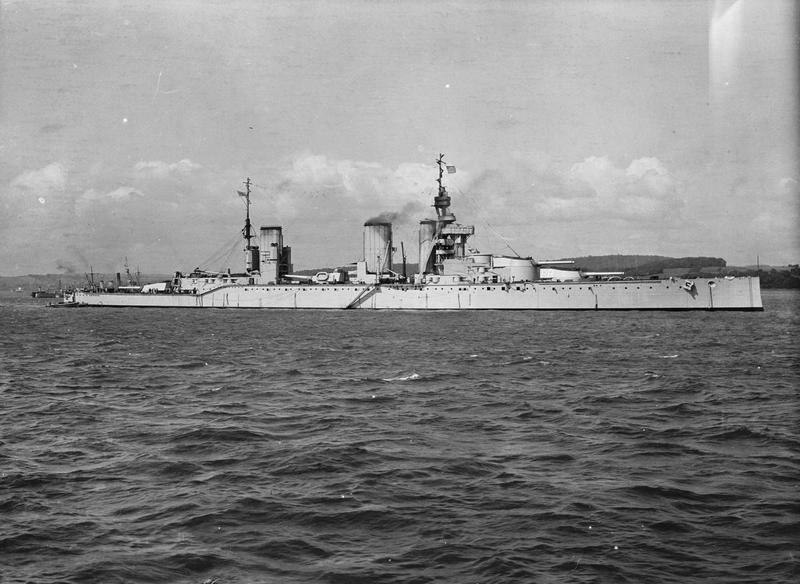 HMS Monarch. This ship carried the 13.5"/45 (34.3 cm) Mark V(L). Bain News Service Photograph as Library of Congress Photograph ID LC-DIG-ggbain-16828. As no spare Mark VI guns had been manufactured, one Mark V(H) gun was carried by HMS Erin for a short period. The sources below disagree as to the muzzle velocity for these guns. I have chosen to use those values given in "British Naval Guns 1880-1945 No 2." Projectiles were nominally 4crh. The railway guns used a new 1,250 lbs. (567 kg) AP shell of 8/16crh which achieved a much greater range. Super charges were used solely by the railway guns. The muzzle velocities given above are for new guns. When worn and due for replacement, the Mark V(L) gun had a muzzle velocity of 2,100 fps (640 mps). The projectile lengths given are average numbers. There were as many as five different manufacturers for these munitions, each producing a slightly different projectile from the others. Ammunition storage given above are the design figures. More rounds were added during the war. Lion was originally given 24 APC, 28 CPC, 28 HE and 6 shrapnel or 86 rounds total per gun. During the early part of the war, this was changed to 110 rounds per gun of 33 APC, 38 CPC and 39 HE. By the time of Jutland (Skagerrak), she carried 66 APC, 22 CPC and 22 HE. The final war outfit was 77 APC (Greenboys) and 33 CPC per gun. The outfits for the other 13.5" (34.3 cm) battlecruisers had similar changes. Ranges with standard charges for the 1,400 lbs. (635) APC shells would be equivalent to those in the previous table. Data in both tables is from "British Battleships of World War Two." The penetration figures in these tables are for an uncapped AP shell striking the plate at 90 degrees, i.e., with the axis of the shell perpendicular to the face of the plate. A capped shell would give about 10 to 20% improvement at low velocities and about 30 to 50% at high velocities. Note that the muzzle velocity for the 1,250 lbs. (567 kg) APC shell in the upper table is much higher than that given in most references. For that reason, I believe that these to be proofing values and not what would be achieved in service. It should be noted here that British APC projectiles before the introduction of the "Greenboy" design were prone to breaking up and premature detonation upon striking thick armor plates. Guns in all mountings were individually sleeved. Mountings with a single asterisk (*) after the Mark Number indicate that they were modified to handle the 1,400 lbs. (567 kg) projectiles. Mountings with a double asterisk (**) after the Mark number indicate a further modification to increase the elevation speed by enlarging the elevation cylinder. These mounts were equipped with the newly invented swashplate training engine which gave them smoother training movements. Two 7-cylinder swash plate engines were provided for each mounting. The Mark II turrets were very similar to the previous BXI mountings used for the 12"/50 (30.5 cm) guns of the St. Vincent class. 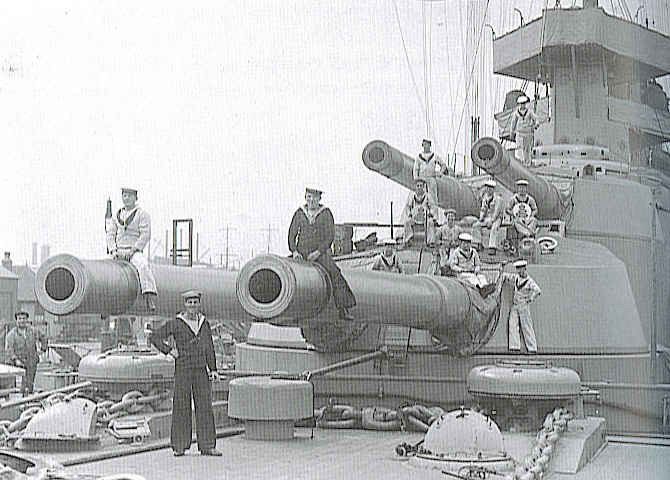 As the designers of the Mark II mounts kept approximately the same dimensions as those for the BXI, the Mark II mounts were cramped and compromises in shell handling were accepted. For example, the projectiles in the Mark II were hoisted at a 38 degree angle in order to maintain about the same hoist dimensions as in the earlier mounting, although the projectiles entered and exited the cage hoist horizontally. Auxiliary supply propellant was eliminated and in their place were secondary projectile and cage hoists outboard of the guns. Stowage for eight rounds per gun were provided in the Mark II and II* gunhouse, with two powered derricks provided to lift the shells. These derricks also lifted shells from the secondary supply hoists mentioned above. Bins for six rounds per gun were arranged in the working chamber below the gunhouse and an emergency shell and cordite supply route was built into the main trunk. The main hoists combined the projectile and propellant cages such that when at the lowest level, the shell cages were in line with the shell bogies in the shell room and the propellant cage was in line with the cordite hoppers in the magazine. When the cage reached the working chamber, the projectile and propellant cartridges were automatically tipped onto loading trays where powered rammers pushed them into the gunloading cage. The Mark II* had improved chain rammers and breech mechanisms and a new type of shell room bogie was introduced that eased moving shells from storage into the hoists. Previously, shells were simply rolled over to the hoists. The Mark III turrets were the first large-caliber mountings to be designed by the Coventry Ordnance Works. It is noted in "The Big Gun" that the ammunition supply arrangements reflected the inexperience of the Covnetry designers and that this resulted in more hand work being necessary than in the Mark II mountings. The gun axes were 90 in (228.6 cm) apart for all mountings. As built the prisms in the director and turret gunsights controlling these mountings allowed ranging only up to an elevation of +15' 21". By the time of Jutland (Skagerrak), some ships had been given removable 6 degree "super elevation" prisms that could be attached to the existing director sights and to the center position turret sights but this process was not completed until 1917. Superfiring turrets could not fire within 30 degrees of the axis because the blast effects would have penetrated into the lower turrets through the sighting hoods. "A" turret on HMS Tiger was to an experimental design whereby the two sighting hoods for the gunlayers were replaced by armored horizontal periscope sight ports on the turret sides. The center sighting hood used by the turret trainer was left in place which negated any advantage to blast protection. These side ports were not repeated on later ships as it was found that they wooded earlier than the sighting hoods on the roof. Q turret on Tiger was in a favorable position which increased its firing arc to 60 degrees before the beam and 90 degrees abaft it on either side, although it could not fire directly aft below about 10 degrees of elevation. Although these mountings were designed to be reloaded at any elevation angle, it was found that the Lion class, which were equipped with two hydraulic run-out pumps, "stalled" at high elevations which slowed the reloading cycle. As a result, loading for these ships was normally performed at a low angle. The Orion class, Queen Mary and Tiger were given three pumps and later battleships were given four pumps. At Dogger Bank it took the battlecruisers 11 seconds to run the guns out at high elevations and the guncrews adapted by lowering the guns before reloading. This would have "unsighted" the gun layers, which must have caused difficulties in maintaining target lock. HMS Princess Royal. This ship carried the Mark V(L). Note the long forecastle, typical of British battlecruiser designs of this period. IWM photograph SP 1683. Forward turrets on HMS Benbow. This ship carried the Mark V(H). 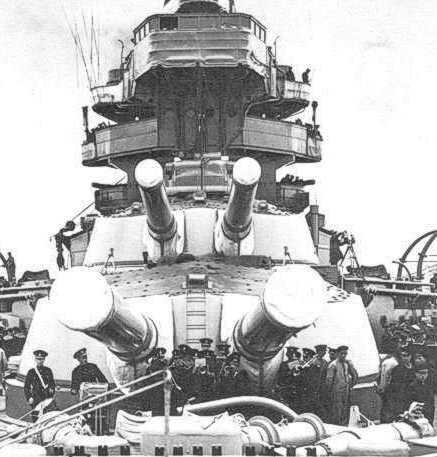 Note the sighting hoods and the riveted-on armor plates on the roof of Turret A which were added following the Jutland (Skagerrak) battle. The rails on Turret B are for an aircraft launching platform. IWM photograph Q 13984. Aft Turrets of HMS Emperor of India. This ship carried the Mark V(H). IWM photograph SP 1745. 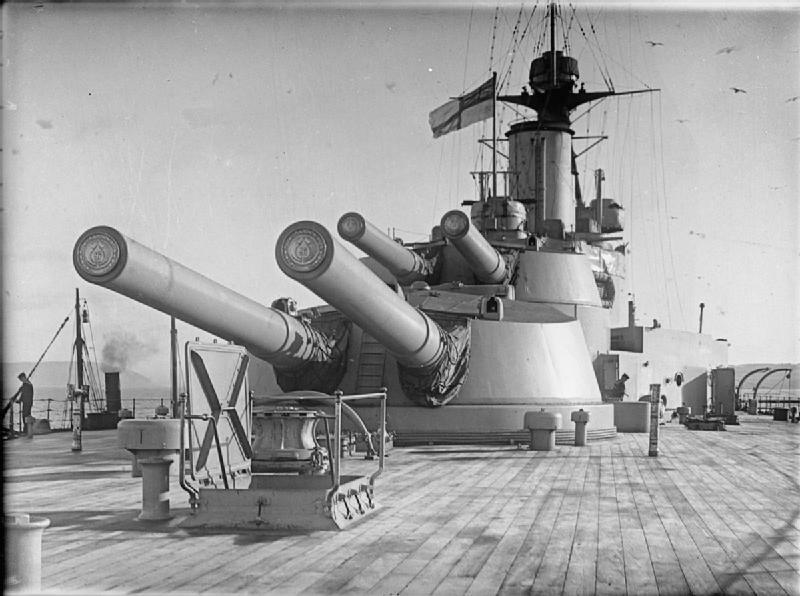 Forward Turrets of HMS Marlborough. This ship carried the Mark V(H). Note the sighting hoods and the added riveted-on armor plates atop the turrets.. 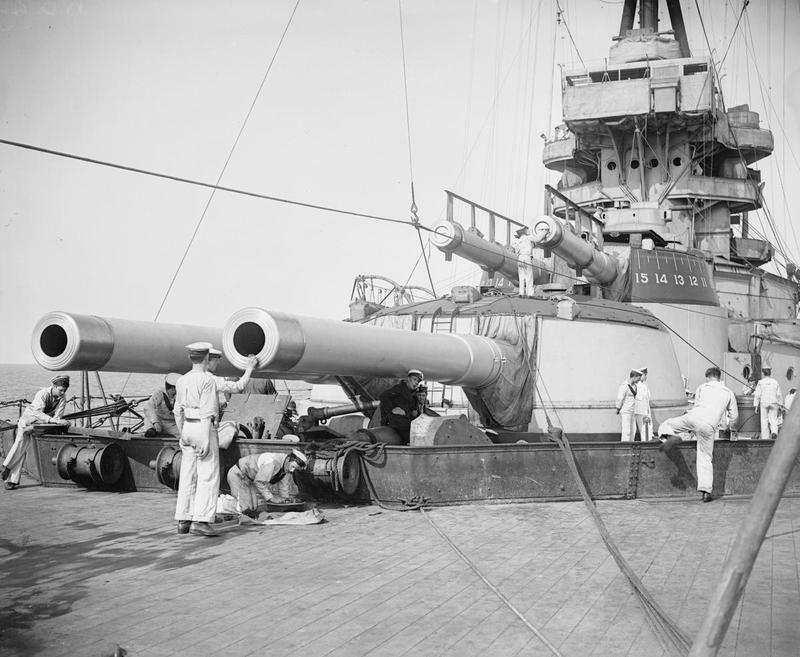 Forward Turrets of HMS Queen Mary in July 1914. This ship carried the Mark V(H). Note the built up nature of the gun barrels. Photograph in the collection of John Roberts.